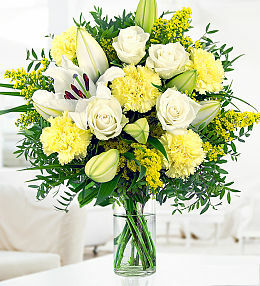 Beautiful flowers available to send online with Prestige Flowers. 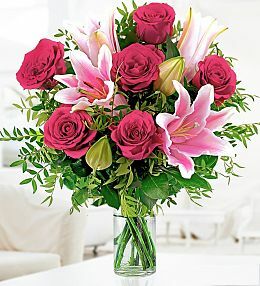 This Roses & Lily bouquet is a Beauty & comes with FREE chocolates! Would you like to make somebody happy and make them feel extra special? Then sending flowers online is a great way to do just that and so much more. Prestige Flowers has a wide range of beautifully assembled flower bouquets of the highest possible quality. The flowers are guaranteed to be delivered fresh and to blossom and stay fresh for days enabling the recipient to enjoy the full beauty of them. Not only can you order flowers and plants, but you can also send delicious chocolates, cuddly teddy bears, yummy cakes and some delightful wines. For those special occasions you can even add colourful balloons to say “Happy Birthday”! It is very quick and easy to order your flowers online, although all the flowers are just stunning so it might be hard to decide on just one bouquet at times. Prestige Flowers offers a great variety of flowers as well as a nice overview of all the different types of flowers and bouquets offered so you are sure to find something to meet your needs. There is a range of different coloured flowers and styles for different tastes, occasions and type of recipient. It is so simple to order flowers online that you can easily do it on the go or briefly during your lunch break. So not to worry if you forgot a birthday or anniversary and no time to visit the local florist in person. With Prestige Flowers you can still ace the perfect surprise and show your loved one or friend just how much you care, and more importantly that you still remembered that special date. You are bound to put the biggest smile on their face and make their day! It has now become even easier and safer to pay for your flower delivery anywhere in the UK. 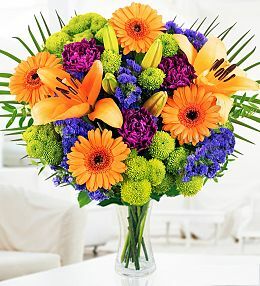 We have safety guaranteed payment options and now even accept PayPal payments, just to make sending flowers even easier. 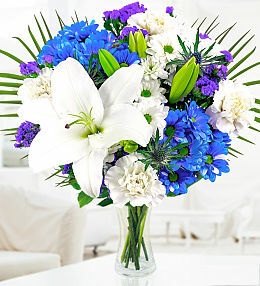 Once you have ordered your chosen flower bouquet, it will be delivered with the care and sentiment it deserves. Flowers are a way of expressing emotions and Prestige Flowers understands the importance of this which is why you can always depend on us to have your flowers delivered to make you and the recipient happy. Remember, with Prestige Flowers you can enjoy the glory of buying flowers online with the promise of gorgeous flowers, prompt deliveries and safe payments.